Our Caramel Corn coated in milk chocolate. Our Caramel Corn coated in dark chocolate. Vanilla coated corn coated in white chocolate. 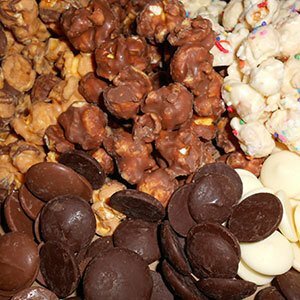 Chocolate popcorn mixed with our house-made peanut brittle pieces. Vanilla coated corn coated in white chocolate sprinkled with birthday confetti. Vanilla coated corn coated in white chocolate with real bits of Oreo. Our Caramel Popcorn coated in peanut butter. Our Caramel Popcorn coated in peanut butter and drizzled with chocolate. Our Caramel Corn, pretzels, and Chex cereal coated in chocolate & peanut butter and then coated in powdered sugar. Caramel Popcorn, marshmallow fluff, Hershey milk chocolate bar, and graham crackers all drizzled in chocolate. Delicious Caramel Pecan Popcorn covered in milk chocolate. Vanilla coated popcorn and pretzels coated in white chocolate.